The paneer making business is considered as the profitable and lucrative. It falls under the milk processing technique. Paneer is widely consumed by some Asian countries like, India, Pakistan, Bangladesh etc. Of late many Western countries other than Asian countries are getting involved in paneer production. In the case of Indian market paneer is either sold fresh or in packed form. It is seen that packaged paneer can last longer than fresh cheese. If anyone wants to start a business this article may help to get into the business. Paneer is widely consumed by the people of India more precisely by the people of South India. The reason behind this popularity is maximum of the population is vegetarian and they find paneer as the best replacement of fish and meat. However, the non-vegetarians also consume paneer and this is why it is available everywhere in the country. You can get paneer in supermarkets, grocery stores, departmental stores, etc. According to the surveys, the hotel and restaurant industries are the largest consumer of paneer. The brand like Amul and Nestle are acquiring 65% of the paneer market. The consumption of paneer in India is increasing up to 30% per year. Therefore, startup business on paneer production can be lucrative to the new businessman. The one who is already in dairy business can easily start a paneer production business. To produce 40 kg of paneer you need 500 litre milk on a regular basis. If you produce 1 ton paneer per month, eventually you will end up producing 12 metric tons paneer per year. Regardless of the size of the business every entrepreneur requires to register for the business. You are required to register for paneer production business. The registration will provide insurance coverage to your business. Apart from that, you need to register the company’s name for legitimate validation. To get your business registered you need to follow the below-stated steps. To start a business first you require a business that you have to arrange it from the municipal corporation. The local municipality also provides space for setting up the start-up business. When it comes to the food product you need to register it under FSSAI. On the other hand, according to the PFA Act (2010), it is required to follow specific condition regarding paneer production. For instance, the moisture quantity will be no more than 70% and the fat content should not exceed more than 50%. You need to go through a quality detection test. Only after passing the test you will get the MSME registration. The entire process can be done online. As a start-up business you need to apply for BIS certificate. In order to start a small business you require a proper space. To establish a paneer production unit at a small scale, you need arrange a place with a minimum area of 1000 square feet. Along with this, you need an area for processing, packing, store room, an area to store the finished product, and an area for transport. To start the business few necessary resources are crucial, for example, water and electricity. Therefore, it is clear that preparing a draft of project report is much needed before establishing the business. When it comes to paneer production the raw material is has to be milk. The milk is mixed with either citric acid or sodium hypochlorite to produce paneer. Paneer expire after three days of manufacture. It should be kept in the freezer rather than out in the normal temperature. It is seen that semi automatic manufacturing unit has gained more success in India. Though technologically advanced machinery can provide immense benefits. The benefits include good quality and high production of paneer. Here are the essential machinery for paneer production. Point to be noted that all these equipment mentioned above are available online websites like Alibaba or India mart. In India people produce paneer at home without using technologically advanced machinery. Here are the steps of making paneer at home. First milk is processed before production of paneer. The milk is heated on the milk boiler. Milk is boiled because it eliminates the germs and disease causing bacteria. The boiled milk also reduces the colloidal calcium phosphate solubility. The temperature that required heating up the milk is 60 degree centigrade. After heating up lemon juice is added to the milk. You can use citric acid instead of lemon juice. The entire material is strained through a fine muslin cloth to separate the water from the material. To separate the last drop of water, the entire thing is suppressed by a heavy object. After getting the paneer it is weighed and cut into pieces and packed accordingly. After packing the paneer is kept in the freezer. Freshly made paneer cannot last more than three days. Therefore, it requires special attention. During the packaging it is delicately handled so that it can last a little longer. The whole idea behind packaging is to increase the life of the product. The packaging can be done in various ways. You can pack the pieces into polythene. In case of industrial production vacuum packaging machine is used. The packaging is finished with the heat sealing and lastly, packed paneer is kept in the freezer. If you are opting for small scale business regarding paneer production then you have to pay for raw materials. The raw materials implies to milk, citric acid, packaging material, electricity, fuel, water, boxes, paste of cheese. If you are opening a small scale business then employees’ salary is also a matter of concerned. The cost of investment can goes up to approximately 2 lack. On the other hand, when the business is started at the large scale the cost of equipment can goes up to 2.30 lack rupees. The cost of raw material can goes up to 2 lack. Therefore, the complete cost can be around 5 to 6 lacks rupees. In order to initiate the business, you need to set the budget. You can sell the product in the market at the rate of 150 to 200 rupees per kilogram. Apart from this, you can direct deal with the hotel industries. Since its high demand the profit margin is significantly high. 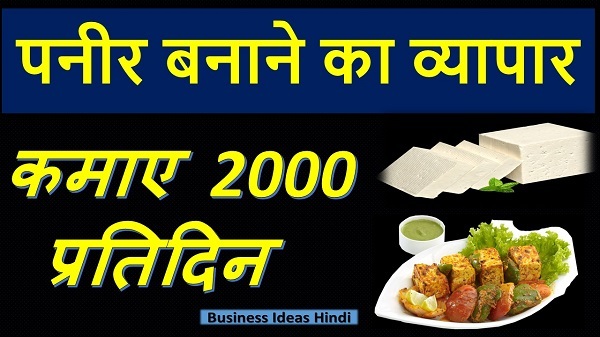 One can earn up to 2000 rupees per day. Those who are the whole sale dealer, for them the profit margin is higher. If you follow the above mentioned process you can earn profit through paneer production business even after investing small amount of money.